We need volunteers! 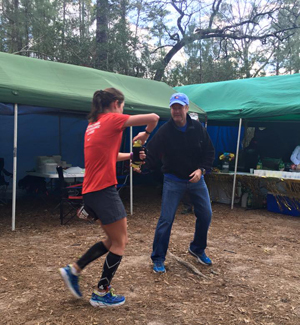 Getting participants to the finish line of an ultramarathon is a COMMUNITY effort. This means our volunteers are a part of every single finisher medal and belt buckle we hand out over those 2 days! It takes a lot of volunteer shifts to make this event successful. We are thankful for our volunteers. Please look over where we need help (those running can still help) and then email us to volunteer! We have a program to reward our volunteers with future free race entries! We keep it simple: accrue credits by volunteering for a shift, trade in your credits for comp entries into our trail or road races. Trail work, course marking, course sweeping : double credits for the same time frame. Parking volunteers needed from 5:00 - 7:30 am (or your race starts if you are running). Just help point cars to where to park. You earn credits towards free races AND can still race that day! Packet pickup volunteers needed from 5:00 - 7:00 am (or your race starts if you are running). Hand out race bibs and shirts. You earn credits towards free races AND can still race that day! Aid station volunteers needed from 7:00 am to 9:30 pm and we can work with whatever shift you can help. We just ask that you choose a 4 hour period. Aid station volunteers help take care of runners during the race - serving water, dispensing food, providing advice, and basic first aid sometimes too. We especially could use someone at each aid station that is CPR-certified and/or First Aid-certified.